Main card page: "Salamangreat Jack Jaguar"
For later anime appearances of this card, see "Salamangreat Jack Jaguar" (later anime). If this card attacks a Defense Position monster, inflict piercing battle damage. 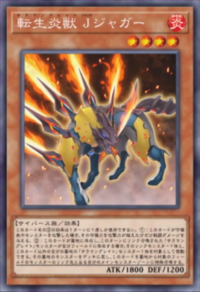 If you control a "Salamangreat" monster(s) that was Link Summoned this turn, while this card is in your GY: You can target 1 of those Link Monsters and 1 other "Salamangreat" monster in your GY; shuffle the second target into the Deck, and if you do, Special Summon this card to your zone the first target points to. You can only use this effect of "Salamangreat Jack Jaguar" once per turn. This page was last edited on 20 March 2019, at 10:38.